‘Tis the season for holiday cards and parties and invitations and presents…the list can really seem to go on and on. 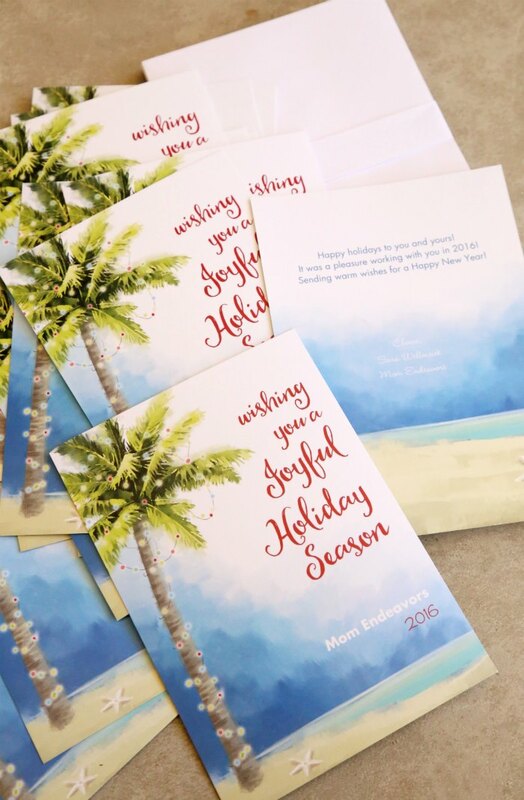 So, to help make things a little easier and more affordable for you this holiday season, we’ve teamed up Megan Media and sponsor Staples on the #GreetingsByStaples blogging program to share some easy options for your holiday printing needs. 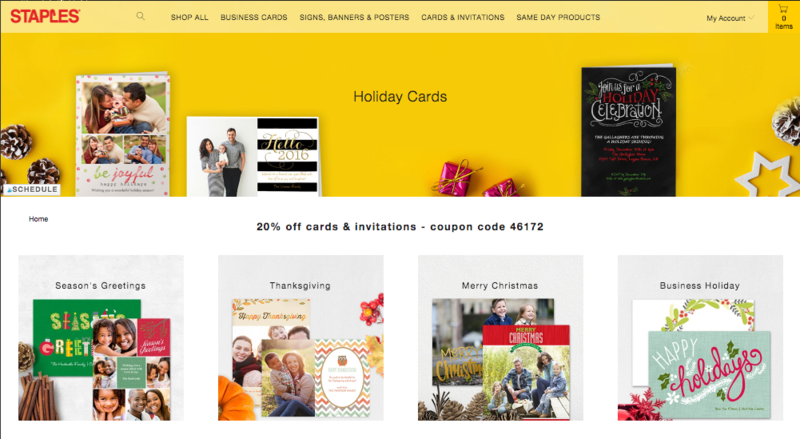 Whether it’s holiday cards, personalized gifts, or prints for your holiday parties, Staples Print & Marketing services are a great choice! Not only are the options affordable, but they are SO easy. You can use the Staples services online and then have items delivered to your door. OR, if you’re in a time crunch, many items can be picked up in the store THE SAME DAY! We utilized their in-store services (after designing & ordering online) and got a jump start on some holiday cards, a poster print gift, and a fun holiday banner! I honestly was really pleasantly surprised by the selection and the quality of the holiday cards at Staples! This fun travel-inspired design was right in the system and I could personalize it how I liked with my choice of colors and fonts. I love that it’s two-sized so you can have the pretty imagery on the front, with a more personalized message on the back. Plus, making the card was SO easy in the Staples Print Services online system. For planning purposes just note that not all options can be picked up in store! So, be sure to check on that before you get started. All the items we made though, we were able to pick up in-store the same day (if we ordered by 2pm) or the next day (if ordered after 2pm). It was pretty sweet to create a few things online and then just head to the store to pick them up a few hours later! In addition to the cards, we also got a poster print. 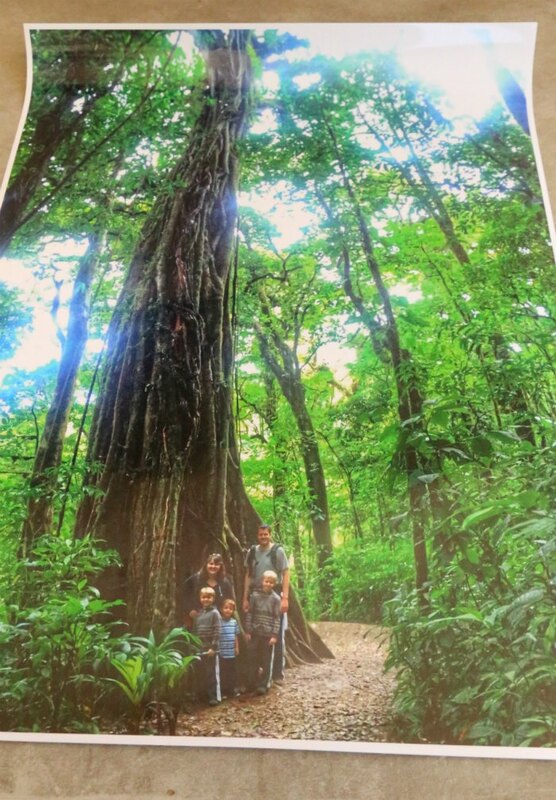 This is one of our favorite images from our trip in Costa Rica this summer, so I decided to make a fun poster of it for my husband’s office. He’s got a fairly new office with a lot of blank wall space and a personalized poster is certainly a fun gift idea. This idea would be perfect for a sports fan too – print a poster of a trip you took to a favorite team stadium or from a game you attendant! Such a fun gift idea! Plus, as you can see with the deals above, the poster prints are also 20% off all season! Our poster even came home in their own “oversized” bag, as did the banner I created! I’m SO excited about this banner discovery! 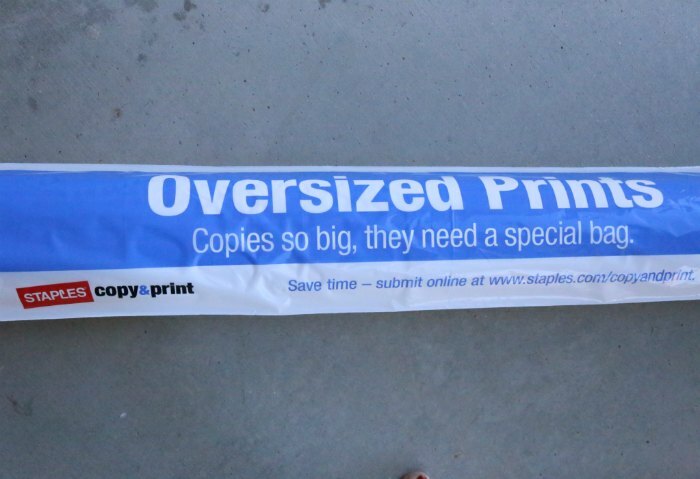 I’ll be using Staples Print Services for more party/holiday banners in the future. Because of the size, the banner was (understandably) more expensive. 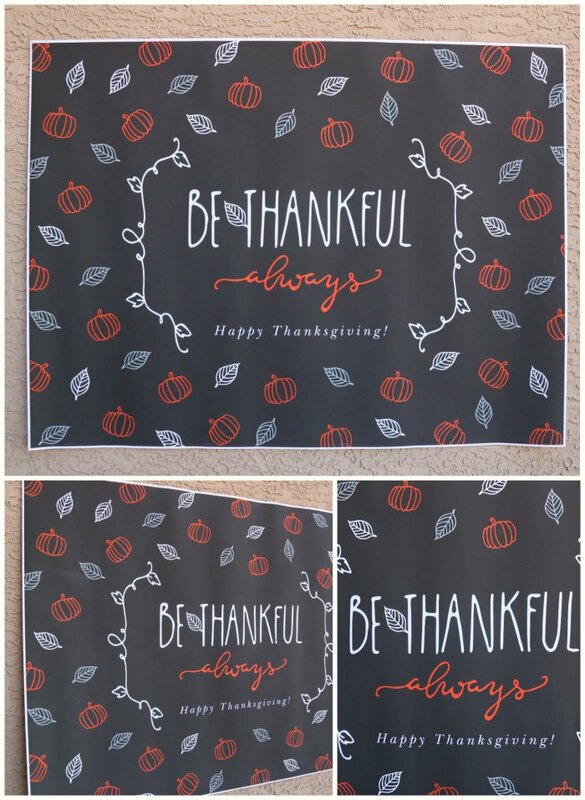 But, I got a fun Thanksgiving-themed one that we should be able to use multiple years in a row for a Thanksgiving dinner wall backdrop! It’s HUGE (like 3ft x 4ft) and I love it! Plus, the design was already right in the system (though you can upload your own design if you’d like) – doesn’t get much easier than that! This was even available for pick up the SAME day! You could make it the day before Thanksgiving and still have it for holiday hosting the next day! WIN! So, if you’re looking for an easy/affordable way to check off some of your holiday to-dos, Staples is a great option! What item(s) would YOU make? I’m so sorry to hear that! Hope it’s been resolved!